Background: There are no published data on trimester-specific reference intervals for thyroid function tests (TFTs) in south Indian pregnant women. Hence, this study was conducted to establish trimester-specific reference intervals for TFTs in south Indian pregnant women. Materials and Methods: This is a cross-sectional study conducted at a tertiary health-care center at Coastal region from South India. A total of 235 healthy women of age >18 years with uncomplicated singleton, intrauterine pregnancy who were consuming iodized salt were recruited for the study. Family history of thyroid illness, history of abortion, goiter, antithyroid peroxidase positivity, overt hypothyroidism, and overt hyperthyroidism were present in 11 (4.7%), 27 (11.5%), 50 (21.3%), 15 (6.38%), 1 (0.42%), and 3 (1.28%) had, respectively, and a total of 73 participants having one of these features were excluded from the study. A total of 162 (I trimester: 47, II trimester: 50, and III trimester: 65) women were included in the analysis to derive trimester-specific reference ranges. Results: The reference ranges for the first, second, and third trimester were 0.08–2.24, 0.42–2.84, and 0.40–3.14 μIU/ml for thyroid-stimulating hormone, 0.68–1.44, 0.59–1.21, and 0.53–1.15 ng/dl for free thyroxine 4 (FT4) and 2.08–3.48, 1.81–3.81, and 1.86–3.38 pg/ml for FT3. Conclusion: Our study reports trimester-specific reference ranges for TFTs in south Indian women from a coastal region. Thyroid hormones play a critical role in neurodevelopment during fetal, neonatal, and early childhood. Maternal thyroid disorders can lead to obstetric complications and irreversible effects on the fetus. Pregnancy is a period of significant hormonal changes and metabolic demands which result in complex effects on thyroid function.,, The physiological changes of normal pregnancy include alterations in the iodine metabolism, increase in β-human chorionic gonadotrophin (β-hCG) level, increase of thyroid hormone-binding globulin caused by hyperestrogenism state of pregnancy, and increase in production of thyroid hormones per se., Due to these physiological changes, maternal and fetal thyroid profiles differ throughout gestation. Pregnancy predisposes to increased occurrence of thyroid disorders with a total prevalence of 2%–4%., The prevalence of overt hyperthyroidism, subclinical hyperthyroidism, overt hypothyroidism, and subclinical hypothyroidism is approximately 0.4%, 3.3% 0.3%, and 2.5%, respectively., Overt maternal hypothyroidism is associated with several maternal adverse effects such as miscarriages, anemia, pregnancy-induced hypertension/preeclampsia, placental abruption, preterm deliveries and postpartum hemorrhage, and adverse fetal and neonatal effects such as congenital circulation defects, fetal distress, low birth weight, and neurological and psychological defects in the child.,, The above adverse consequences of maternal thyroid dysfunction point out the need for screening pregnant women for thyroid disorders with valid biomarkers with distinct reference ranges. Subclinical hypothyroidism during pregnancy is also associated with adverse maternal outcomes such as increased risk of miscarriages and preterm labor. However, the definition of subchorionic hemorrhage during pregnancy highly controversial and the level of thyroid-stimulating hormone (TSH) at which levothyroxine four replacement should be started to provide optimal maternal and neonatal outcome is uncertain. The latest American Thyroid Association guidelines suggest treating pregnant women with TSH more than the upper limit of normal for trimester-specific reference ranges. To adopt such a guideline, it is essential to establish trimester-specific reference ranges from the local population. Few Indian studies are available which have established trimester-specific reference intervals for thyroid function test (TFT). However, there are no published data on trimester-specific reference intervals for TFTs in south Indian pregnant women. Hence, this study was conducted to establish trimester-specific reference intervals for TFTs in the south Indian pregnant women. This is a cross-sectional study conducted Narayana Medical College and Hospital, Nellore, between December 2014 and September 2016. The study was approved by the Institutional Ethics Committee, and a written informed consent was obtained from all participants. Participants were recruited from antenatal clinics of the institute. Healthy women of age >18 years with uncomplicated singleton, intrauterine pregnancy who were consuming iodized salt were included in the study. Patients with a history of hyperemesis gravidarum, known thyroid illness or abortions, chronic systemic illness, family history of thyroid illness, presence of goiter, antithyroid antibodies, and overt hypothyroidism defined as TSH: >10 μIU/ml with or without low free thyroxine 4 (FT4) or overt hyperthyroidism defined as TSH: <0.01 μIU/ml with or without high FT4 were excluded from the study. Serum samples for testing thyroid functions were collected between 8:00 am and 10:00 am after participants have fasted for 8–10 h. Serum levels of FT3, FT4, TSH, and antithyroid peroxidase (anti-TPO) antibodies were assayed by chemiluminescence method using Access 2, Beckman Coulter. Using the above laboratory methods, kit-based normal reference ranges, analytic sensitivity, and intra-assay coefficient of variation for TSH, FT4, and FT3 were 0.34–5.60 μIU/ml, 0.003 μIU/l, and 6.5%, 0.61–1.12 ng/dl, 0.25 ng/dl, and 5.3%, and 2.5–3.9 pg/ml, 0.88 pg/ml, and 5.7%, respectively. Anti-TPO was considered as positive if the titers were more than 34 IU/ml. All the data values were entered into Microsoft Excel, and statistical analysis was performed using IBM SPSS for windows version 22.0 (SPSS software, Chicago, IL, USA). For categorical variables, the data values are represented as number and percentages and to test the association between the groups, Chi-square test was used. For continuous variables, the data values are shown as the mean ± standard deviation (SD). To test the mean difference between the two groups independent t-test was used and to test the mean difference between three or more groups, ANOVA was used. To derive the reference ranges, outlier values (>1.5 times the interquartile range) were excluded. P < 0.05 was considered as statistically significant. The study population comprised 235 healthy, uncomplicated pregnant women consuming iodized salt, who visited for regular antenatal checkups. The mean age of the study group is 23.78 ± 3.8 years. Of these, 61 (26%) were in the first trimester, 78 (33.2%) in the second, and 96 (40.9%) in the third trimesters. Of 235, 98 (41.7%) were primigravida and 137 (58.3%) were multigravida. A family history of thyroid illness was present in 11 (4.7%) participants. 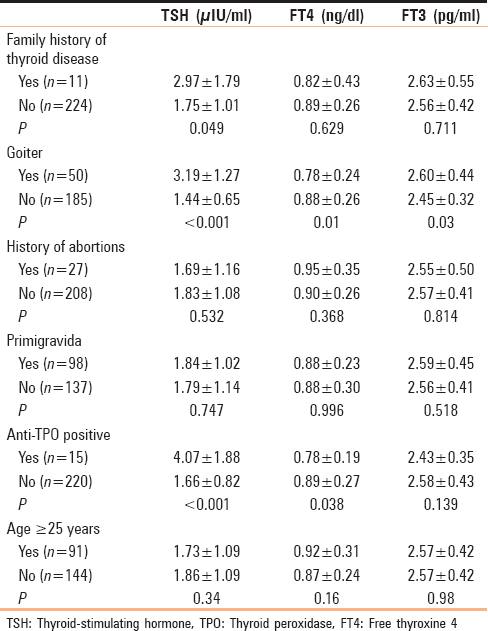 History of abortions was present in 27 (11.5%) participants. On examination, goiter was present in 50 (21.3%) participants. Anti-TPO antibodies were positive in 15 (6.38%) participants. One (0.42%) participant had overt hypothyroidism and three (1.28%) had overt hyperthyroidism due to gestational thyrotoxicosis. Comparison of TFT based on different clinical and laboratory parameters is summarized in [Table 1]. A total of 73 participants meeting at least one of the exclusion criteria were excluded and the remaining 162 (I trimester: 47, II trimester: 50, and III trimester: 65) were included in the analysis to derive trimester-specific reference ranges. The mean age of reference population was 23.3 ± 3.6 years. The mean ± SD, median, and 2.5th–97.5th percentiles for TSH, FT4, and FT3 of the study population included to derive reference ranges are summarized in [Table 2]. The mean and median TSH values significantly increased from the first to second and the third trimesters (P = 0.005). Mean and median FT4 values decreased significantly from the first to second and the third trimesters (P = 0.037). There were no significant differences in the mean and median FT3 values across the trimesters (P = 0.367). We report trimester-specific reference intervals for TFTs in the south Indian pregnant women from a coastal region. Race and ethnicity may play a role in the establishment of reference intervals for TFTs. It has been proposed that the reference intervals of TSH and FT4 are significantly influenced by race and race-specific TSH reference intervals which should be employed to provide accurate intervals for a specific population which would minimize the misclassification of patients with thyroid disease., Few studies have demonstrated lower TSH cutoffs during the first and second trimester in Asian women than Caucasian women., Hence, it is important to have race-specific reference ranges for TFT in pregnant women. India consists of diverse population, and hence, region-specific reference ranges may be required. This is the first study to report trimester-specific reference ranges for thyroid functions in south Indian women. Although a smaller study, it provides useful information due to lack of data on trimester-specific reference ranges for thyroid functions in south Indian women. Reference ranges for thyroid functions during pregnancy were different from the nonpregnant adult reference ranges provided by the kit. Similar findings have been reported by most of the previous studies not only from India but also throughout the world. In most of the previous studies, upper and lower limit of normal of both TSH and FT4 were lower during pregnancy.,,,,,,,,, Although our study did not compare reference ranges for TSH and FT4 in pregnant women with that of nonpregnant adults from the same region, the obtained values for TSH were lower than the corresponding values in nonpregnant adults provided by the kit manufacturer. Most of the studies from different parts of the world, including those from India, have reported lower TSH cutoffs during pregnancy than nonpregnant adults.,,,,,,, In contrast, two studies from New Delhi using similar assay methods reported relatively higher TSH cutoffs for all the three trimesters than most of the other Indian studies, as well as the nonpregnant adult reference, ranges provided by their kit manufacturer., However, the exact reason for this finding from these two studies is not clear. Reference ranges for FT4 in our study were relatively lower than those reported by most of the previous Indian studies. The previous Indian studies which reported higher reference ranges for FT4 in pregnancy used kits for which the FT4 reference ranges in nonpregnant adult were also high [Table 3]. In most of the studies, FT4 reference ranges in pregnant women were correlated well with the corresponding reference ranges in nonpregnant adult women. Surprisingly, the lower as well as upper limits of FT4 for all the three trimesters in the manufacturer's data were lower than that of our study. Few other studies which have established trimester-specific reference ranges in other countries have also yielded lower FT4 when compared to studies using different assays., FT4 estimated by Beckman is demonstrated to be lower than that by Abott and Roche in pregnant women. Hence, it was likely that lower FT4 reference ranges in our study than the other Indian studies are related to the differences in assay and not due to the regional differences. Hence, if in a given population, the reference ranges for a specific assay are not established, using the reference ranges provided with the kit for the assay used may be more appropriate than using the reference ranges established in the same population using a different assay method. However, use of the same assay methods in the population from the same region may also yield different reference ranges., Hence, the role of other factors such as different exclusion criteria, iodine status, or other unrecognized factors accounting for the variability in FT4 ranges may not be excluded. Slightly higher trimester-specific reference ranges for FT4 in our study than those of manufacturers may be due to small sample size of our study; however, the role of regional differences, the definition of euthyroid status, or iodine status cannot be excluded. As demonstrated in most studies, TSH levels increased and FT4 levels decreased from the first trimester to second and the third trimester. The major mechanism behind the lower TSH and higher FT4 reference limits in early pregnancy is increased in hCG production by the placenta which activates the thyroidal TSH receptor to produce more T4.,, Consistent with the above findings, FT4 demonstrated decreasing trends with the progression of gestation. Lower FT4 cutoffs during latter trimesters of pregnancy may be due to increased thyroid-binding globulin (TBG) leading to a decrease in FT4. However, this is transient phenomenon and less likely to contribute significantly to low FT4. Low FT4 during latter parts of pregnancy is more likely due to the interference of TBG with direct methods of FT4 immunoassays. Measurement of serum FT4 concentrations during pregnancy by immunoassays is unreliable and may under or overestimate. FT4 measurements obtained indirectly by the FT4 index or directly by equilibrium dialysis and ultrafiltration, or if available, by solid-phase extraction-liquid chromatography/tandem mass spectrometry, may provide more reliable estimates of thyroid function during pregnancy. The prevalence of goiter (21.3%) and family history of thyroid illness (4.7%) in our study were similar to those reported by previous Indian studies (20%–22.58% and 3.7%)., However, the prevalence of spontaneous miscarriage history (11.5%) was lower in our study than other Indian studies (24.3%–24.7%)., These differences in the prevalence of miscarriages between the studies could be due to differences in iodine status and thyroid autoimmunity. In our study, anti-TPO positivity (6.38%) was slightly lower than that reported by other Indian studies (7.9%–9.93%). Serum TSH was higher and FT4 was lower in those with goiter or anti-TPO positivity than those without, thereby justifying the exclusion of pregnant women with these features while selecting the reference population. Our study had few limitations. First, iodine status was not evaluated in our study population. However, the population from the coastal area have been shown to be iodine sufficient. Second, intervals for total T3 and total T4 were not established. Third, but the major limitation of the study is the small sample size. A minimum of 120 measurements are recommended for interval calculations of a parameter with 90% confidence. However, due to high interindividual variability and skewness for TSH, a minimum of 400 individual measurements per trimester are recommended., Hence, there is a need for a larger similar study in a similar population with proven iodine sufficiency. Our study reports trimester-specific reference ranges for TFTs in south Indian women from a coastal region. Utiger RD. Maternal hypothyroidism and fetal development. N Engl J Med 1999;341:601-2. Mestman JH. Hyperthyroidism in pregnancy. Best Pract Res Clin Endocrinol Metab 2004;18:267-88. Fantz CR, Dagogo-Jack S, Ladenson JH, Gronowski AM. Thyroid function during pregnancy. Clin Chem 1999;45:2250-8. Abalovich M, Amino N, Barbour LA, Cobin RH, De Groot LJ, Glinoer D, et al. Management of thyroid dysfunction during pregnancy and postpartum: An endocrine society clinical practice guideline. J Clin Endocrinol Metab 2007;92:S1-47. Skjöldebrand L, Brundin J, Carlström A, Pettersson T. Thyroid associated components in serum during normal pregnancy. Acta Endocrinol (Copenh) 1982;100:504-11. Guillaume J, Schussler GC, Goldman J. 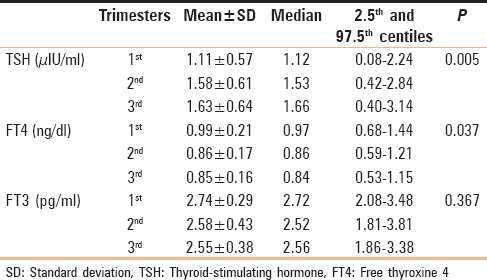 Components of the total serum thyroid hormone concentrations during pregnancy: High free thyroxine and blunted thyrotropin (TSH) response to TSH-releasing hormone in the first trimester. J Clin Endocrinol Metab 1985;60:678-84. Lazarus JH, Smyth PP. Iodine deficiency in pregnancy: Iodine deficiency and supplementation in pregnancy. In: Preedy VR, Burrow GN, Watson R, editors. Comprehensive Handbook of Iodine: Nutritional, Biochemical, Pathological and Therapeutic Aspects. Oxford: Academic; 2009. p. 469-76.
WHO Secretariat, Andersson M, de Benoist B, Delange F, Zupan J. Prevention and control of iodine deficiency in pregnant and lactating women and in children less than 2-years-old: Conclusions and recommendations of the technical consultation. Public Health Nutr 2007;10:1606-11. Su PY, Huang K, Hao JH, Xu YQ, Yan SQ, Li T, et al. Maternal thyroid function in the first twenty weeks of pregnancy and subsequent fetal and infant development: A prospective population-based cohort study in China. J Clin Endocrinol Metab 2011;96:3234-41. Nazarpour S, Ramezani Tehrani F, Simbar M, Azizi F. Thyroid dysfunction and pregnancy outcomes. Iran J Reprod Med 2015;13:387-96. Kannan S, Mahadevan S, Sigamani A. A systematic review on normative values of trimester-specific thyroid function tests in Indian women. Indian J Endocrinol Metab 2018;22:7-12. Boucai L, Surks MI. Reference limits of serum TSH and free T4 are significantly influenced by race and age in an urban outpatient medical practice. Clin Endocrinol (Oxf) 2009;70:788-93. Surks MI, Boucai L. Age- and race-based serum thyrotropin reference limits. J Clin Endocrinol Metab 2010;95:496-502. La'ulu SL, Roberts WL. Second-trimester reference intervals for thyroid tests: The role of ethnicity. Clin Chem 2007;53:1658-64. Price A, Davies R, Heller SR, Milford-Ward A, Weetman AP. Asian women are at increased risk of gestational thyrotoxicosis. J Clin Endocrinol Metab 1996;81:1160-3. Yan YQ, Dong ZL, Dong L, Wang FR, Yang XM, Jin XY, et al. Trimester- and method-specific reference intervals for thyroid tests in pregnant Chinese women: Methodology, euthyroid definition and iodine status can influence the setting of reference intervals. Clin Endocrinol (Oxf) 2011;74:262-9. Panesar NS, Li CY, Rogers MS. Reference intervals for thyroid hormones in pregnant Chinese women. Ann Clin Biochem 2001;38:329-32. Liu J, Yu X, Xia M, Cai H, Cheng G, Wu L, et al. Development of gestation-specific reference intervals for thyroid hormones in normal pregnant northeast Chinese women: What is the rational division of gestation stages for establishing reference intervals for pregnancy women? Clin Biochem 2017;50:309-17. Zhang J, Li W, Chen QB, Liu LY, Zhang W, Liu MY, et al. Establishment of trimester-specific thyroid stimulating hormone and free thyroxine reference interval in pregnant Chinese women using the Beckman coulter uniCel™ dxI 600. Clin Chem Lab Med 2015;53:1409-14. Stricker R, Echenard M, Eberhart R, Chevailler MC, Perez V, Quinn FA, et al. Evaluation of maternal thyroid function during pregnancy: The importance of using gestational age-specific reference intervals. Eur J Endocrinol 2007;157:509-14. Rajput R, Singh B, Goel V, Verma A, Seth S, Nanda S, et al. Trimester-specific reference interval for thyroid hormones during pregnancy at a Tertiary Care Hospital in Haryana, India. Indian J Endocrinol Metab 2016;20:810-5. Maji R, Nath S, Lahiri S, Saha Das M, Bhattacharyya AR, Das HN. Establishment of trimester-specific reference intervals of serum TSH & fT4 in a pregnant Indian population at North Kolkata. Indian J Clin Biochem 2014;29:167-73. Deshwal VK, Yadav A, Gogoi J. Comparison of FT3, FT4 and TSH levels in pregnant women in Dehradun, India. J Acad Ind Res 2013;4:239-41. Sekhri T, Juhi JA, Wilfred R, Kanwar RS, Sethi J, Bhadra K, et al. Trimester specific reference intervals for thyroid function tests in normal Indian pregnant women. Indian J Endocrinol Metab 2016;20:101-7. Available from: http://www.monobind.com/core/media/media.nl?id=1237&c=445858&h=95881b725f5aa74e47b6&_xt=.pdf. [Last accessed on 2018 May 18]. Haddow JE, McClain MR, Lambert-Messerlian G, Palomaki GE, Canick JA, Cleary-Goldman J, et al. Variability in thyroid-stimulating hormone suppression by human chorionic [corrected] gonadotropin during early pregnancy. J Clin Endocrinol Metab 2008;93:3341-7. Grün JP, Meuris S, De Nayer P, Glinoer D. The thyrotrophic role of human chorionic gonadotrophin (hCG) in the early stages of twin (versus single) pregnancies. Clin Endocrinol (Oxf) 1997;46:719-25. Haddow JE, Palomaki GE, McClain MR. Thyroid-stimulating hormone in singleton and twin pregnancy: Importance of gestational age-specific reference ranges. Obstet Gynecol 2006;107:205-6. Sapin R, D'Herbomez M, Schlienger JL. Free thyroxine measured with equilibrium dialysis and nine immunoassays decreases in late pregnancy. Clin Lab 2004;50:581-4. Kalra S, Agarwal S, Aggarwal R, Ranabir S. Trimester-specific thyroid-stimulating hormone: An Indian perspective. Indian J Endocrinol Metab 2018;22:1-4.